Imagine it. Your team has the skills and techniques they need to make the best decision. Fast. Smart. Efficient. It’s not impossible. In fact, it’s simple. Once they know how. That’s where Dr. Edward de Bono’s Six Thinking Hats® comes in. This systematic method of thinking brings rapid results - reaching better decisions in less time. More light, less heat, in any meeting. It is a simple, effective technique that helps you and your meetings be far more productive. You and meeting participants can learn how to separate thinking into six distinct categories. 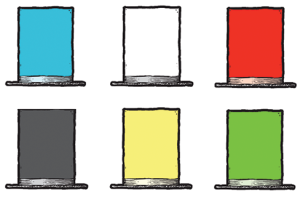 Each category is identified with its own coloured metaphorical “thinking hat.” By mentally wearing and switching “hats,” you can easily focus or redirect thoughts, the conversation, or the meeting. Pre-workshop questionnaire and inputs to reflect on meeting effectiveness and identify questions and relevant meeting topics to work on during the workshop. A one day interactive, tailored and energising Six Thinking Hats® workshop is filled with short inputs & examples, practice, coaching and feedback. Participants will work in small groups with continual support from a certified de Bono trainer. Dr. Edward de Bono personally developed the course materials, and each delegate is supplied with a comprehensive workbook as an ongoing resource. Follow-up access to refresher modules, tips, newsletter and social media groups.